The religious leaders participating in the UN’s World Harmony celebration gather before the General Assembly. 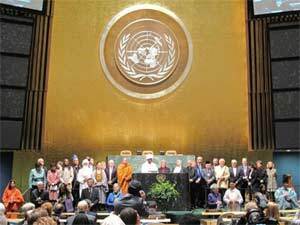 A rare event took place in the UN General Assembly on February 7, 2012: religious and secular leaders from around the world gathered to affirm “Common Ground for the Common Good,” marking the close of the second annual World Interfaith Harmony Week (February 1-7). The diverse religious voices began with H.E. Archbishop Francis Assisi Chullikatt, the Permanent Observer of the Holy See to the United Nations, who said that the Pope and Church leaders had repeatedly called on all believers to reject religiously-motivated violence. Other religious voices were Acharya Shri Shrivatsa Goswami of India, Bhai Sahib Mohinder Singh of the U.K., Imam Feisal Abdul Rauf of New York, Ven. Dr. Chung Ohun Lee of the Republic of Korea, Rev. Michael Bernard Beckwith of California, and Rabbi David Rosen, who spoke movingly of the need to engage religious groups in making peace in the Holy Land. Distinguished speakers highlighted the role of faith communities in conflict mediation, disaster prevention and response, revitalization of the United Nations, and sustainable development. Yuka Saionji of Byakko Shinko Kai in Japan moved everyone to tears thanking them for their prayer support of Japan after the earthquake and tsunami. As a grand finale, 20 brass players of the Salvation Army New York Staff Band came down the aisles to play “Joyful, Joyful.” Indeed. Click here for a video of the three-hour celebration.